Review: Do you like stories about the trials and tribulations of African slaves? If you do, than the story My Name is Not Angelica is the book for you. Written by Scott O' Dell, this story is a wonderful one in which Raisha, called Angelica by the Danish people, is brought over to the Danish Virgin islands. I've jumped ahead of myself. Let me tell the story from the beginning. 16-year-old Raisha lives in a tribe with her native people in Africa. The whole tribe is invited to a king's banquet, so they immediately accept the offer. During the night, when the tribe is sleeping, Raisha, Konje, to whom Raisha is betrothed, and Dondo are taken by slavers and transported to the Danish Virgin islands. The small island is having a drought and the slaves are working extra hard. Slaves are encouraged to stay with their masters and they will be tortured if they disobey. Escaped slaves have been gathering in local encampments and talk to each other in the same way that they would communicate in Africa, by talking drums. Konje escapes and soon becomes the head of a camp. After Dondo is caught trying to free a slave, he is tortured and Raisha heads to the local camp that Konje leads. Many slaves gather there and are planning to defend themselves when they receive news that French soldiers from nearby Martinique are coming. They face almost certain death when they are outnumbered by the French soldiers. Everybody jumps over the cliffs so they can't be punished for what they did, that is, everybody except Raisha, who tries to save the life of her unborn child. I found My Name is Not Angelica very interesting. At first it was a bit difficult to keep the numerous characters straight, but it got easier as the story progressed. The story flew by at the beginning and it didn't concentrate on the details as much as I would've liked. However, I felt as though I was right there with Raisha going through the difficult situations she faced. Believe me, there were many decisions that she had to make and she knew that each one would change her life forever. It would be a pretty hard decision to make. I highly recommend this book especially for kids looking for a quick but interesting read. It is a fairly easy read, probably targeted for a middle school audience. I rate it 5 out of 5 stars. We would like to thank Houghton Mifflin Harcourt for providing a copy of My Name is Not Angelica for this review. 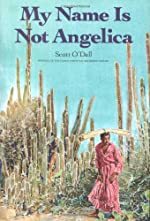 Have you read My Name is Not Angelica? How would you rate it?